Used properly, this unique implement safely reduces calluses and rough, dry, hard skin buildup fast. 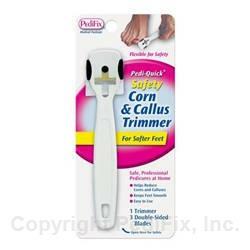 Only the PediFix Trimmer features a flexible, non-slip handle that prevents excess pressure and callus removal. 1 trimmer per pack. 3 blades are included in each pack. The buildup of hard skin (corns and calluses) is your body’s natural protection against pressure and friction. You do not want to remove too much skin during one use. Thin shaving from gently-applied pressure is recommended, which is why PediFix’s Safety Trimmer is flexible, not rigid. Soak area to be treated in warm water. Dry thoroughly. Hold Trimmer against skin and gently apply light pressure while drawing Trimmer toward you — always in the direction of the handle. Blade is SHARP! Handle with care. Do not use this product if you have diabetes, any circulation disorder, poor eyesight or poor hand-eye coordination. Do not use on foot warts. If symptoms persist, visit a foot specialist.